Chandigarh: Chitkara University is happy to announce that its professor Dr. Nitin Saluja, Assistant Director Research from Chitkara University Research and Innovation Network (CURIN) has got selected in Economic Times – Power of Ideas, an event by Department of Science and Technology (DST) and Facebook. At Chitkara University, Research and Innovations are the prime focus for the students from their first day at the campus. Chitkara University Research and Innovation Program (CURIN) is the department designed dedicatedly for research and innovation on the campus. Through this department, professors, researchers, and students get a chance to work across disciplines to extend their boundaries of knowledge. Chitkara University has 12 centres under CURIN that are contributing to build and sustain thought leadership of Innovations. These centres are involved in cutting-edge research, exploring new technologies to improve the country’s infrastructure and safety and thereby contributing to the society through their discoveries. Economic Times (ET) Power of Ideas is aimed at creating an entrepreneurial ecosystem in India. ET Power of Ideas received over 5,800 business summaries from participants from across the country. This time, over 300 ideas have been shortlisted to go pitch in front of the panellists after refining their ideas with mentors. Dr. Nitin Saluja’s Idea E-Pancreas made it to the top 60 list after four phases of selection. 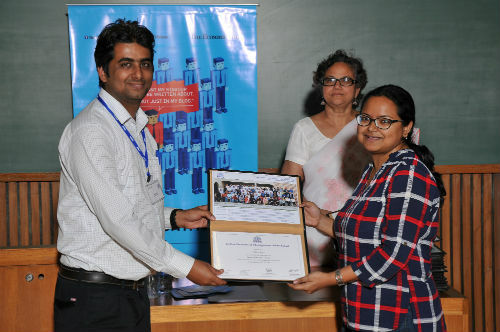 The four stages of the selection process were conducted at a seven-day boot camp with excellent pitches to investors in Indian Institute of Management, Ahmedabad. Dr. Nitin has been awarded a grant of two lakh rupees for further enhancement of the idea and its validation.